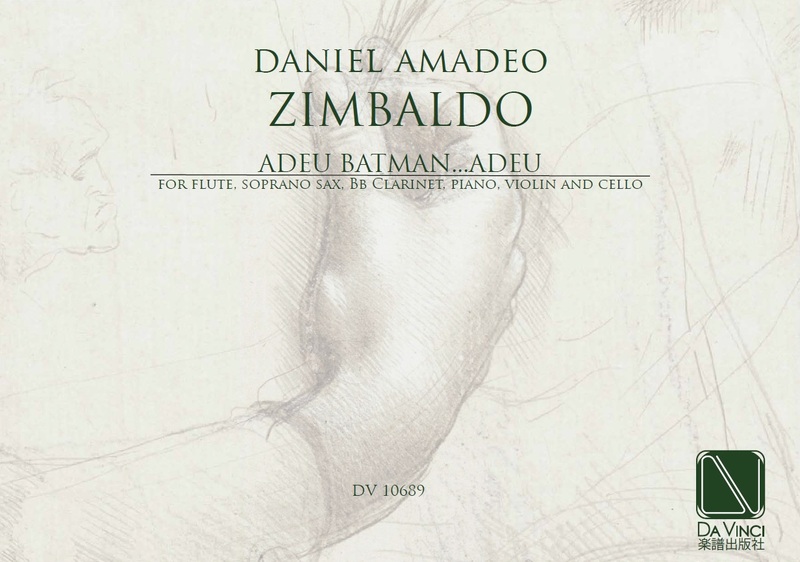 Daniel Amadeo Zimbaldo: spanish composer, born in Argentina, of mostly chamber, vocal and electroacoustic works that have been performed throughout the world; he is also active as a music therapist. Mr. Zimbaldo studied composition with Virtú Maragno at the Universidad Nacional de Rosario from 1973–79 and studied analysis, contemporary music and electronic music privately with Dante Grela in Rosario from 1974–78. He later had postgraduate studies in composition with Luis de Pablo at the Real Conservatorio Superior de Música de Madrid from 1981–84 and studied electronic music with Roger Cochini at the Groupe de Musique Électroacoustique de Bourges in 1984–85. He later studied music therapy at the Universidad del País Vasco – Instituto Música, Arte y Proceso de Vitoria from 1995–98 and at the Fundación Rudolf Steiner de Madrid from 2000–03, where he earned his degree in Waldorf education. Among his honours are three one-year grants from the Instituto de Cooperación Iberoamericana in Madrid (1981–84), the Premio Cristóbal Halffter for music for organ in Ponferrada (1987, for Credo [El Libro de las Mutaciones… IV]), the Premio Speziale di Composizione de la SIAE in the competition Cinema – La Colonna Sonora in Trento (1988, for Omaggio a Luigi Dallapiccola), the Prix de Musique Électroacoustique à Programme in the Concours International de Musique Électroacoustique de Bourges (1996, for Cartas desde el Real Hospital de Lunáticos), and a residency at the Academia de España in Rome from the Ministerio de Asuntos Exteriores (1999). As a music therapist, he was a founding member of the Asociación de Profesionales de Musicoterapia in Vitoria in 1996, in which he remains active. He introduced the Somatron for vibroacoustic therapy to Spain in 1997 and founded the Aula de Musicoterapia at the Conservatorio de Música y Danza Montserrat Caballé in Arganda del Rey in 2006. He is also active in other positions. He wrote the radio series Perfiles: La Música de Luigi Dallapiccola for Radio Nacional de España in Madrid in 1987 and the book Aproximación a la música de Luigi Dallapiccola (2011, Editorial Arpegio). He has served as a music advisor to Radio Televisión Española in Madrid since 1989. He served as coordinator and technical advisor for the CD Música electroacústica española (1997, Asociación de Música Electroacústica de España) and as technical advisor for the DVD Curso interactivo de música (2001, Editorial Salvat). Moreover, he has written several articles on health and music, including for the music journal 12 Notas in Madrid. He taught music history at the Escuela Municipal de Música de Rosario from 1977–79, analysis at the Universidad Nacional de Rosario in 1980, counterpoint at the Conservatorio Profesional de Música de Albacete in 1987–88, and counterpoint and fugue at the Conservatorio Profesional de Música de la Comunidad Autónoma de Madrid from 1988–91, where he co-founded the Laboratorio de Música Electroacústica in 1991. He has taught children with learning disabilities part-time at music schools of the Comunidad Autónoma de Madrid since 2003. He has lived in Spain since 1981.